When Gmail loads images into the cache, the user’s device and geo information gets lost. An open will originate from a Mountain View IP address like 66.249.93.70. And the user agent, which normally holds the user’s device information, looks like ‘Mozilla/5.0 (Windows; U; Windows NT 5.1; de; rv:1.9.0.7) Gecko/2009021910 Firefox/3.0.7 (via ggpht.com)’. This messes up your geo reporting map. It also limits opportunities to display customized banners to users on different devices (e.g. iOS versus Android) and users from different parts of the world (e.g. IP from Germany versus IP from the US). Furthermore, images lie now static in Gmail’s cache- for hours or forever. 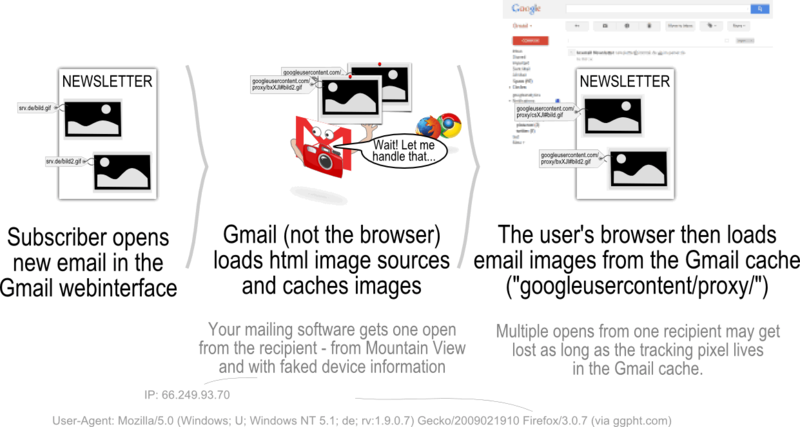 Exchanging images on your webspace will not be visible to Gmail users until the cache is renewed. Think for example of offers, which are no longer valid, and of broken or wrong images that you want to switch. You can’t. 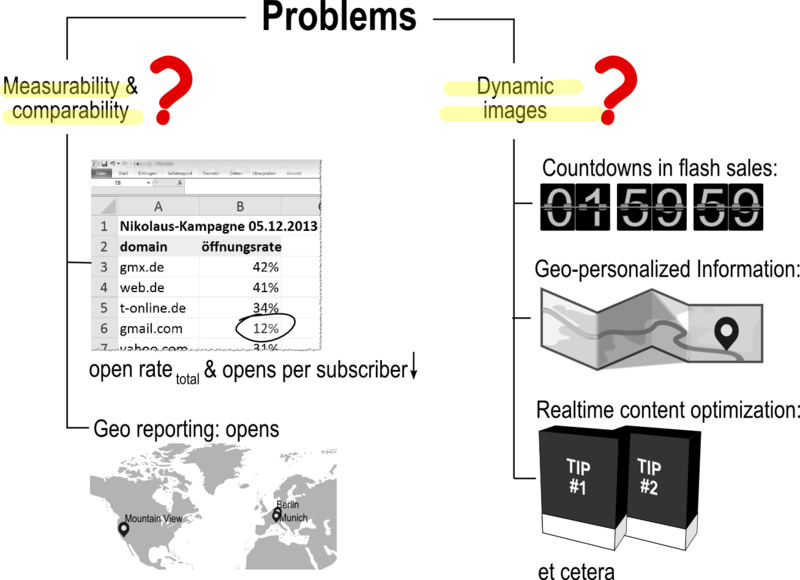 This also affects real time multivariate creative optimization and open tracking. When the tracking pixel is cached, another open from one tracking URL hits the cache, not the tracking server of your mailing software. This may lead to a decreasing number of total opens or, in extreme cases, to counting unique opens only. As reported by Andrew from emailexpert.org, reduced open tracking does not affect every service. CampaignMonitor for example seems to be immune, whereas MailChimp tracks only unique opens as long as the tracking pixel lives in Gmail’s cache. What do both do different? One could think of using different or additional means to track opens like requesting a CSS file or a sound file. But both seem to use just an invisible tracking image, which is placed at the end of an email. I think the crucial difference is that the MailChimp server returns a resource of type ‘image’. That’s what Gmail is looking for. And that’s what Gmail caches. The CampaignMonitor server does – at first glance – not return an image. Gmail ignores it, and every call hits the CampaignMonitor server so that every open is counted. Ergo: If you want to measure your total opens, don’t let your tracking URL return a resource of type ‘image’ with a predefined content-length greater than zero. Gmail changed their caching procedures in the past days. As Movable Ink points out, senders should be able to track multiple opens by transmitting a no-cache header, now. This entry was posted in english and tagged gmail, tracking, trackingpixel. Bookmark the permalink. As far as I can tell CampaignMonitor indeed returns nothing. It is not a valid image and therefore the image cache didn’t cache anything and calls the url each time the email is being opened. Lyric and SmartFocus might just see, that the Google cache expires after several minutes. Also when opening the same email on a different client (e.g. mobile phone) I’ve noticed additional non-unique opens. We need to generate unqiue image link for each email we sent at that time i think , google will request every time for the image , we wont be able to track the ip of the user but still be able to know who has opened our emails. Security wise users will be more happy and Tracking wise i think we will get much better tracking reports. Pingback: Gmail adota cache de imagens. Qual o impacto no Email Marketing? …Does the http fix also resolve the issues with geolocation and user agent? Nope. I doubt there will be a solution to this soon. The ‘fix’ prevents Gmail from caching a web bug. I’m a bit confused, sorry to beat a dead horse. Doesn’t the tracking pixel give info related to geolocation and user agent? I set the Content-Length to 0, dispatch a Newsletter to 11 different Gmail accounts an opened them. Unfortunately I got only the Google-user-Agent. Is it sure, that setting the content-lenght to 0 is working? If the http request returns ‘nothing’, then Gmail doesn’t cache the result. This works for me. I.e. this way, I can continue counting multiple opens. This of course is no solution to getting the user’s user agent and IP. How can I make a fake-pixel? I made a header with content-type: image/gif, but without any image and content-length, when I send a campaign in the body of message the “fake pixel” goes with error 500. Can you help me?